We are entering the third part of this course, in which you read Eric Schlosser's Fast Food Nation. We are moving away from the stereotypical frontier of western movies or borderlands conquest, but we are not moving as far as it might seem. Eric Schlosser’s book begins with the image of fast-food deliveries to the heavily-armored air force base inside Cheyenne Mountain, near Colorado Springs. “It looks like the backdrop of an old Hollywood western,” Schlosser writes, “And yet Cheyenne Mountain is hardly pristine” (1). He implies that this is not the western story the movies lead us to expect. It’s not Turner’s frontier myth – but, by now in this class, you should be able to recognize this portrait of Cheyenne Mountain as ALSO a western story, even though it doesn't look like a John-Wayne movie. It’s a story that shares many themes with the first half of our class. It’s a story of environmental plunder, reliance on technology, government involvement alongside proclamations of capitalist independence, hopes for economic mobility alongside realities of class stratification, and myriad issues of conquest and historical forgetfulness. This week, we’ll focus on assembly-line frontiers. Next week will be issues of economics, then issues of government. In studying pop culture such as fast food, there’s always a danger of studying it trivially – but Schlosser makes it significant by making connections to the same issues of frontier analysis that we have been using throughout this class. 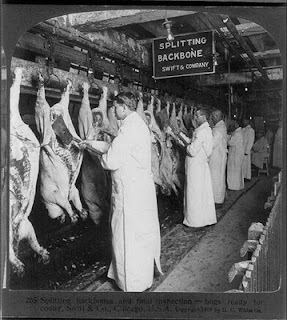 America's first assembly lines were actually disassembly lines, disassembling hogs and cattle in order to turn them into sausage and steak. Starting in Chicago in the 1860s, up to 300 workmen would work on a single pig, each doing a small task again and again, in a form of corporate labor efficiency that helped feed America's urbanizing population while also providing a reason for all those cattle drives, providing employment for America's cowboys. The stereotypical frontier myth focuses only on the cowboys out on the open range, not on this corporate assembly-line to which the cows were being driven: but both are necessary parts of the story. 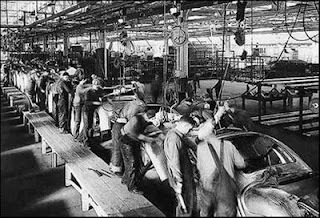 In the 1910s, Henry Ford adapted the techniques of meatpacking disassembly lines to create his automobile assembly line. The workers stand still while cars move past them on a conveyor belt. The workers lose control over the pace of work, they lose much of the variety in their workday, and they also lose control over training new workers. The corporation gets a standardized, efficient product. The workers hated Ford's assembly line. They quit so often that Ford had to hire and train an entire new workforce two to three times each year. So Ford added another side to the assembly line: he offered his workers $5 a day, more than twice the going wage. Their work-hours might be painfully monotonous, but the high pay offered the compensation of a worthwhile leisure time. Ford did this not because he was a philanthropist (he wasn't), but because he wanted to save the money he had been spending on constantly replacing workers. He also wanted his workers to be able to afford to buy the cars they were making, in order to keep his business thriving. This is what scholars call Fordism, and it is what some scholars say is the key to understanding America. Fordism convinced workers to give up power over production and focus their hopes on consumption. Fordism blurred class lines between working-class and the middle-class. Although most of us no longer work on assembly lines, many of us still live lives affected by Fordism, lives where we're not sure if we're middle-class or working-class, lives where we look for satisfactions in the area of consumption, not production. We sell our weekdays to pay for our weekends. "Build houses like Fords," recommended Edward Filene, a department-store businessman who was actually a philanthropist too. Filene wanted to make houses as efficiently and cheaply as Ford had made his automobiles. But bringing assembly-line efficiencies to home-building is challenging, mostly because houses can't move on a conveyor belt. Still, by the 1940s several mass-builders figured out ways to create houses like Fords. In Levittown on the East Coast and Lakewood on the West Coast, mass developments sprung up. You may already know Lakewood: it's not too far from Fullerton. Here is a series of photos that Lakewood's developers hired William Garnett to take. They show the assembly-line fashion of building as teams of workers moved over the land, each doing a separate task, grading, framing, and completing the houses. There were only four models of houses, interspersed randomly, stretching out to the horizon. Neighbors would often face the mirror image of their own house. Carl Karcher declares at the end of chapter one that he believes in "progress," paving over the orange groves. To you, are these photos of Lakewood "progress"? Is this a town that you would want to live in? Many commenters were appalled by these photos of Lakewood. It seemed to lack true community, true history, or true diversity (blacks were banned until the 1960s, although Jews and Okies and other not-quite-whites were allowed in). Elites found it easy to critique the monotony of Lakewood: it seemed to be the opposite of frontier individualism. But defenders explained that, despite the monotonous construction, the actual residents could bring humanity to this corporate landscape, and they truly the appreciated the opportunity for less-wealthy people to have a home of their own with a yard. The photographs celebrate house frames precise as cells in a hive and stucco walls fragile as unearthed bone. The photographs look down before the moving vans arrived, and before you and I learned to play hide-and-seek beneath the poisonous oleander trees. That is slippery language: poisonous trees, terrible and beautiful. What is Waldie's attitude toward this kind of mass-built subdivision? What is your own? 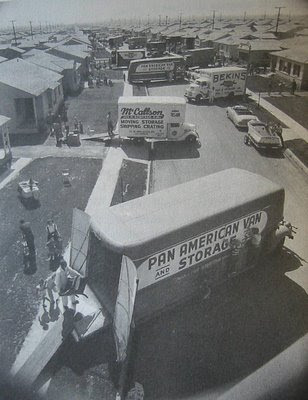 Life Magazine staged this photo of moving day in Lakewood, 1950. (Life offered the moving vans free publicity: notice how each moving company's name is carefully visible.) Lakewood's residents didn't actually all move in at exactly the same moment. Still, it seemed like an instant town, like the earlier western boomtowns, though this time the residents were not mining gold, just seeking golden sunshine and a backyard. We can see this as a new version of Turner's frontier, seeking a bungalow with a backyard barbecue instead of a farm-lot or mining-claim, seeking a place of consumption instead of a place of production, but still seeking a little bit of land of one's own, and still hoping that land-ownership might lead to upward mobility, this time through rising housing prices instead of through farming or mining. 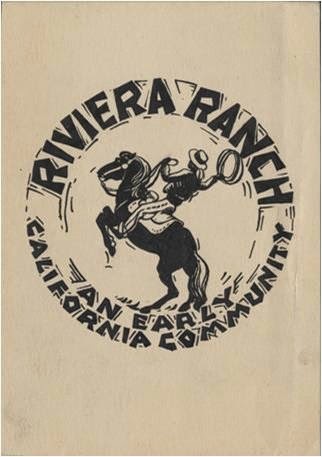 Have you ever noticed how many California housing developments are called "Rancho"? 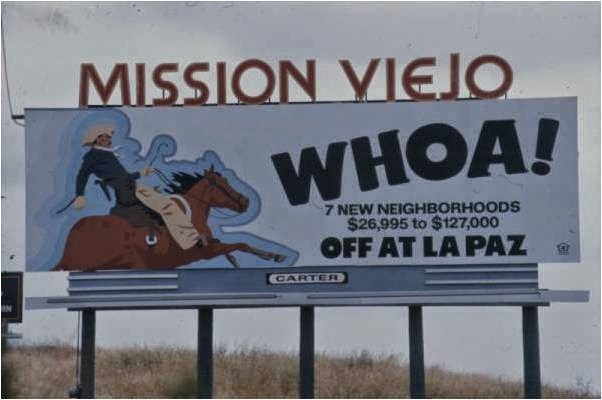 Many of Southern California's mid-century suburbs advertised themselves with frontier imagery. See how our class is starting to come full circle? The suburbs are related to the frontier, in weird ways worth disentangling. The suburbs and the frontier are also related to the fast food industry. 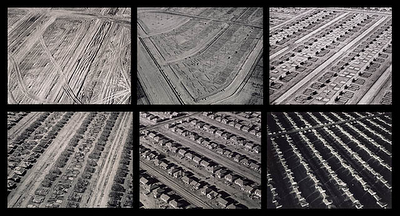 As Schlosser explains, postwar American suburbs were "the architectural equivalent of fast food" (60). Subdivisions, like fast-food restaurants, used techniques of assembly-line labor: breaking down work into its simplest forms, hiring cheap labor to do repetitive tasks in order to make a mass-produced, homogeneous, sanitary, highly-promoted, affordable product for consumers. In Schlosser's view, suburbs, fast-food, and also Disneyland all aspired to be "factories of fun." 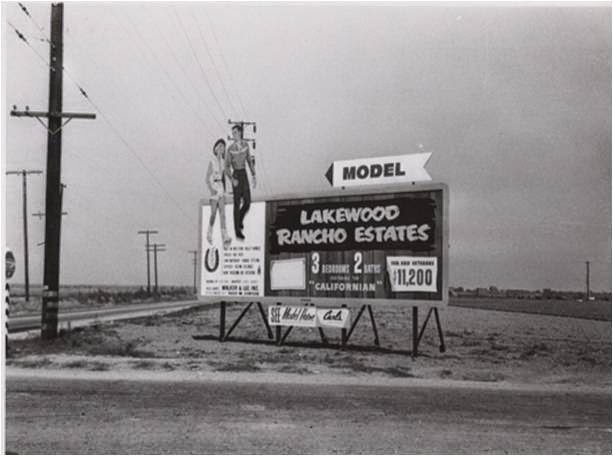 Disneyland was built not long after Lakewood, and in the same area, seeking to capitalize on the new highways crisscrossing what had been farm land. They all also disguised their assembly-line factory-like processes with appeals to mythical frontiers. The 1950s frontiers of suburbs, Disneyland, and fast food each profited from each other, synergistically - even though Walt Disney actually turned down Ray Kroc when he first sought to build a McDonalds at Disneyland. Disneyland, like America's fast food industry depended on the car-culture that Ford had started and the suburban leisure-oriented culture that was mushrooming around Southern California in the 1950s. For most of you, the post-1945 period is probably when your family came to Orange County, not in the covered wagons of the 1880s but in the cars and then airplanes of the post-world-war-II era. That was when the economy of Orange County boomed. As you'll recall, boom and bust economies are part of the frontier of America. Carl Karcher, Ray Kroc, and suburban developers all capitalized on that post-1945 boom. All these businesses, as is typical for the west, relied on hidden government subsidies. The highways that brought commuters to suburbs, amusement parks, and fast-food restaurants had been built as a defense project, as you can see from the label of this 1956 map. 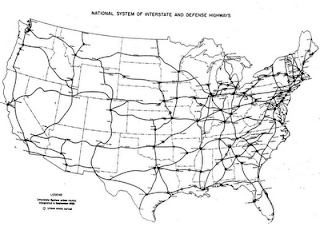 The original goal of interstate highways was to help people evacuate cities quickly in case of nuclear war. The original residents of Lakewood were largely employed by the McDonnell-Douglass factory, making military airplanes for the U.S. government, at a location that seemed safely outside of the nuclear fallout area around Los Angeles. This synergy of private corporations depending on government and military funding is part of what Schlosser evokes in his opening scene of Cheyenne Mountain, and it is part of the story of America's west. 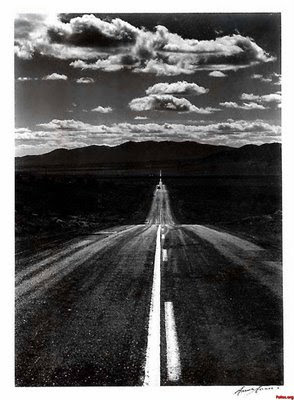 It should make the openness of this Ansel Addam photo from week one now seem different, now that you can think together about the open space of the frontier and the confined space of the assembly line, and the ways that both are dependent on the other -- and the ways that both create the landscape in which you yourself probably live. Hi I am a middle school student in New Jersey, and I am working on a research project for a competition called national history day (NHD). I really enjoyed your blog because the information about the housing industry's use of the assembly line was very useful to my project. Thank you!